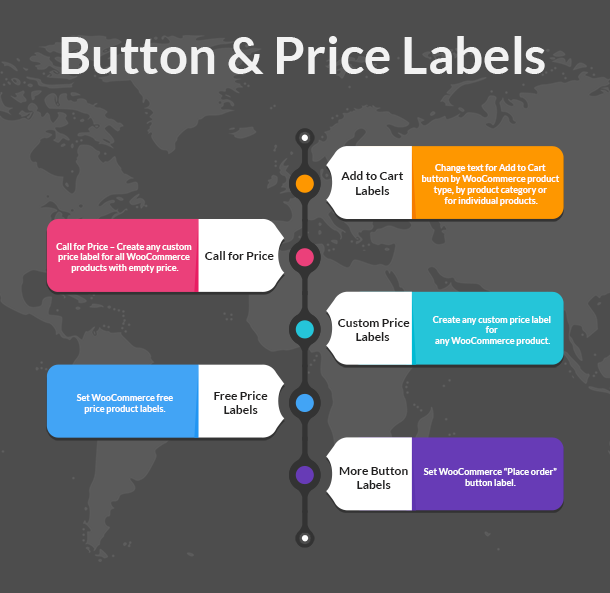 More Button Labels – Set WooCommerce “Place order” button label. 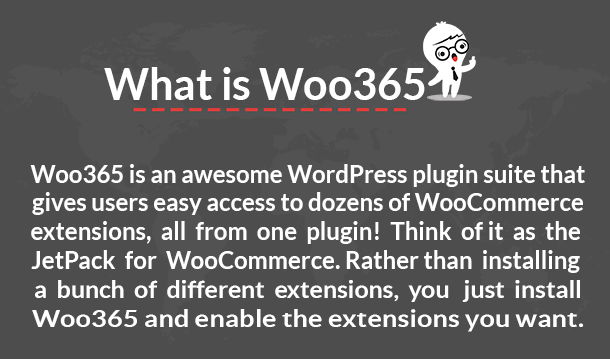 Cart Custom Info – Add custom info to WooCommerce cart page. Cart Customization – Customize WooCommerce cart – hide coupon field; item remove link. Checkout Core Fields – Customize WooCommerce core checkout fields. Disable/enable fields, set required, change labels and/or placeholders. Checkout Custom Fields – Add custom fields to your WooCommerce checkout page. Checkout Custom Info – Add custom info to the WooCommerce checkout page. Checkout Customization – Customize WooCommerce checkout – hide “Order Again” button etc..
Checkout Fees – Add fees to WooCommerce cart & checkout. Checkout Files Upload – Let customers upload files on WooCommerce checkout. Coupon by User Role – WooCommerce coupons by user roles. 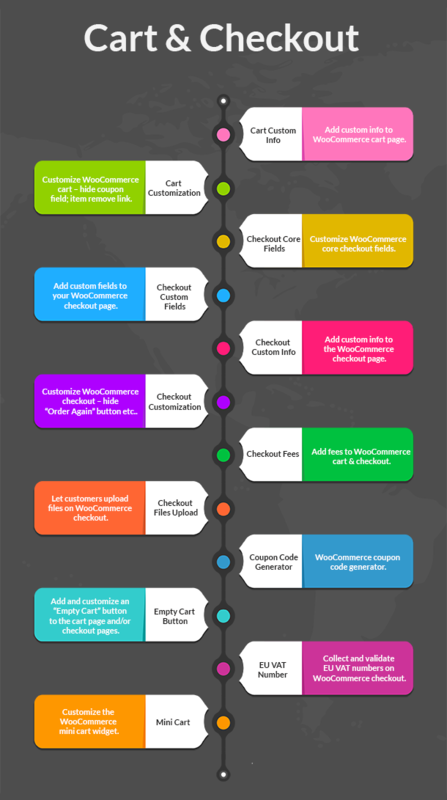 Coupon Code Generator – WooCommerce coupon code generator. Empty Cart Button – Add and customize an “Empty Cart” button to the cart page and/or checkout pages. EU VAT Number – Collect and validate EU VAT numbers on WooCommerce checkout. Automatically exempt VAT for valid numbers. Add all EU countries VAT standard rates to WooCommerce. Mini Cart – Customize the WooCommerce mini cart widget. Admin Tools – WooCommerce debug and log tools. Custom CSS – Another custom CSS, if you need one. Custom JS – Separate custom JS for front and back end. General Tools – Custom roles tool. Shortcodes in WordPress text widgets. Modules By User Roles – Enable/disable modules by user roles. 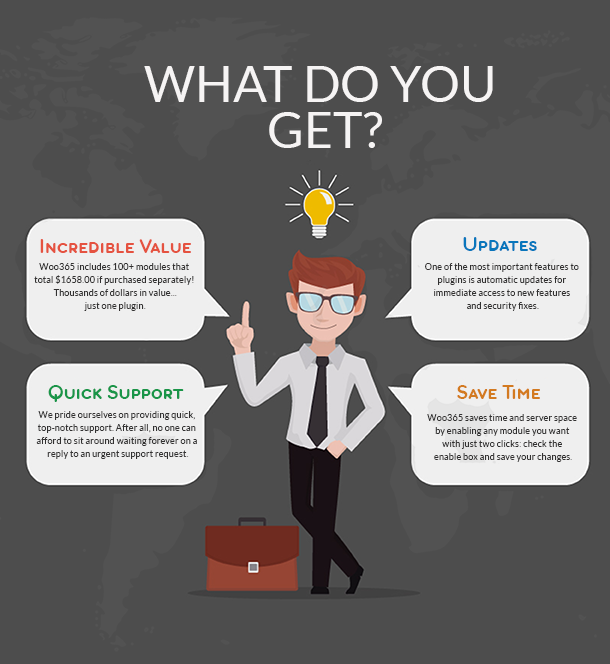 WPML – Basic WPML support. Breadcrumbs – Customize WooCommerce breadcrumbs. Custom Emails – Add custom emails to WooCommerce. Email Options – WooCommerce email options. E.g. 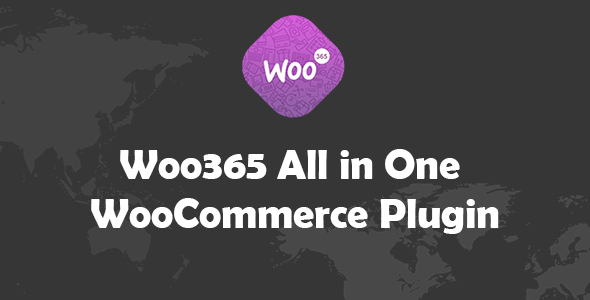 : add another email recipient(s) to all WooCommerce emails. Email Verification – Add WooCommerce email verification. Export Tools – Export WooCommerce orders, customers and products. 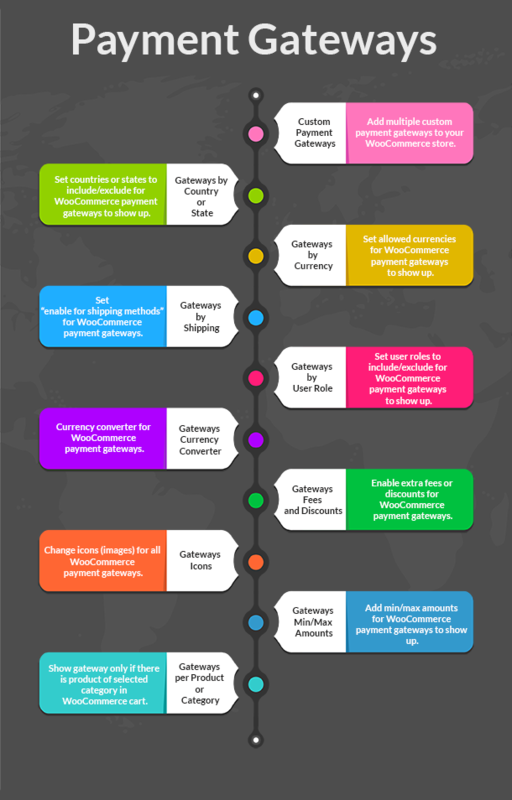 My Account – WooCommerce “My Account” page customization. Remove Old Products Slugs – Remove old slugs for WooCommerce products. Reports – WooCommerce stock, sales, customers etc. reports. URL Coupons – WooCommerce URL coupons. User Tracking – Track your users in WooCommerce.